Built in the mid 1900’s, the lodge is rich in history and unique architecture. The main lodge is the center of the property where you spend deck time and dine for dinner. Our historic farm setting is also home to a herd of alpacas and wild deer. The intimate 38-acre setting on Malcolm Island in Northern British Columbia is perfect for getting away with family, friends or business associates. A maximum of 18 guests allows personal service that cannot be matched by large resorts. While at Sund’s Lodge, guests stay in one of our 12 guest rooms, which are either original Cedar cabins built with wood harvested from our local woods, or small log cabins built with Vancouver Island Douglas Fir trees. 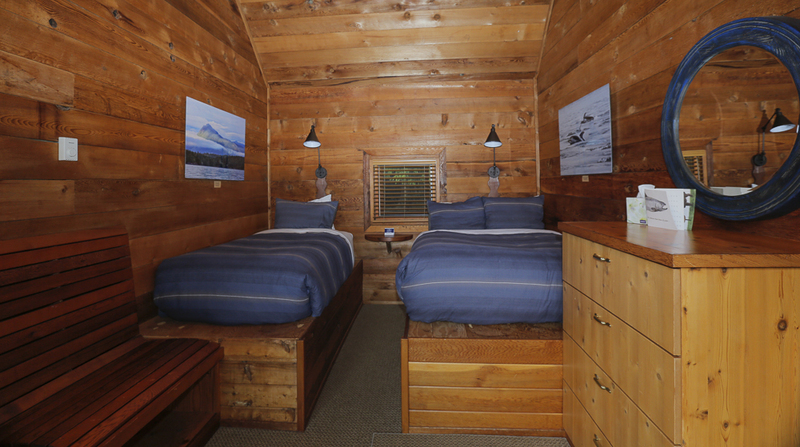 All of our cabins are furnished to feel like a home away from home. Most rooms have two beds in each room and all cabins have a private bath. Comfortable beds are adorned with down comforters and cotton sheets. Our cabins and rooms have beautiful views of Blackfish Sound. Over the 2017/2018 winter, the cabins received a refresh with new mattresses, bed linens, furniture and decor. The cuisine at Sund’s Lodge is truly the finest. Every meal overwhelms senses of taste, smell, and sight. Our chefs serve superb 4-course dinners and great tasting breakfast and lunches to make the mouth water. We make every attempt to promote local food suppliers that promote ecologically safe and sustainable procedures so that no shortcuts are taken to give you a truly local taste of British Columbia. Although the 4-course dinners are the highlight of the dining experience, no experience is more beloved at Sund’s Lodge than the Sunds tradition of the Beach Bistro. After a morning out fishing, you will meet our chef and service team on an island for the Beach Bistro. A gourmet lunch of fresh boiled crab, fine wine, and other delicacies is enhanced by the setting of beautiful British Columbia landscape. This is truly a dining experience like you’ve never had before, and likely will never forget. During the afternoon breaks from fishing, you might want to explore the area on a bicycle or a sea kayak, sit in the hot tub or the old-fashioned sauna. Play a game of pool or take a walk down the road or through the old cedar forest on the back of the property.